Since more than 40 years now, the Illustrated Professional Dictionary of Horology (usually called Berner Dictionary) represents the reference book for watch professionals and lovers all over the world. Its new compact version brings together 4,790 terms within a single bound copy of some 1,300 pages. The dictionary also exists in a CD-Rom version (PC). For more information, click here. 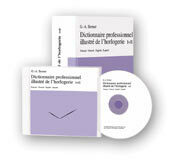 Available in four languages (French, German, English, Spanish), it can be ordered through the FH E-shop. Aperture Small opening. The dials of some watches (in French: montres à guichet) have apertures in which certain indications are given (e.g. the date, the hour, etc). Applique Applique or applied chapters are numerals or symbols cut out of a sheet metal and stuck or riveted to a dial. Assembling Process of fitting together the components of a movement. This was formerly done entirely by hand, but the operations have now been largely automated. Nevertheless, the human element is still primordial, especially for inspection and testing. Assortiment French term for the parts used for making an escapement. Automatic Watch A watch whose mainspring is wound by the movements or accelerations of the wearer's arm. On the basis of the principle of terrestrial attraction, a rotor turns and transmits its energy to the spring by means of an appropriate mechanism. The system was invented in Switzerland by Abraham-Louis Perrelet in the 18th century. Balance Moving part, usually circular, oscillating about its axis of rotation. The hairspring coupled to it makes it swing to and fro, dividing time into exactly equal parts. Each of the to-and-fro movements of the balance ("tick-tack") is called an "oscillation". One oscillation is composed of two vibrations. Bar, lug In wristwatch-cases, a thin metal rod fixed between the horns, for attaching the wristlet. Barrel Thin cylindrical box containing the mainspring of a watch. The toothed rim of the barrel drives the train. Bridge Complementary part fixed to the main plate to form the frame of a watch movement. The other parts are mounted inside the frame (part of the "ébauche"). Calibre Originally used to mean the size of a watch movement, this term now denotes a type of movement (men's calibre, automatic calibre, etc). When a calibre number is accompanied by the manufacturer's mark, it serves as an indication of origin. (Watch-) Case Container that protects the watch-movement from dust, damp and shocks. It also gives the watch as attractive an appearance as possible, subject to fashion and the taste of the public. Casing (up) Process of inserting and fixing a watch movement into its case. Chablon French term for a watch movement (not including the dial and hands), of which all or part of the components are not assembled. Chronograph Watch or other apparatus with two independent time systems: one indicates the time of day, and the other measures brief intervals of time. Counters registering seconds, minutes and even hours can be started and stopped as desired. It is therefore possible to measure the exact duration of a phenomenon. Not to be confused with the timer, the stopwatch and the chronometer. Chronometer Watch which has undergone a series of precision tests in an official institute. The requirements are very severe: a few seconds per day in the most unfavourable temperature conditions (for mechanical watches) and positions that are ordinarily encountered. Crown Knurled knob located on the outside of a watch case and used for winding the mainspring. It is also used for setting the hands to the right time and for correcting thecalendar indications. Date Ordinal number referring to a day of the month: the 10th February. Date-watch: watch indicating the date, the month and sometimes the year and the phases of the moon. Also called a calendar-watch or calendar. Perpetual calendar: watch indicating leap years as well as the date. Dial Indicating "face" or plate of metal or other material, bearing various markings to show, in ordinary watches and clocks, the hours, minutes and seconds. Dials vary verymuch in shape, decoration, material, etc. The indications are given by means of numerals, divisions or symbols of various types. Direct-drive Refers to a seconds-hand that moves forwards in little jerks. Trotteuse, French term for a direct-drive seconds-hand, especially a centre seconds-hand. Display Indication of time or other data, either by means of hands moving over a dial (analogue display) or by means of numerals appearing in one or more windows (digital or numerical display); these numerals may be completed by alphabetical indications (alphanumerical display) or by signs of any other kind. Example: 12.05 MO 12.3 = 12 hours, 5 minutes, Monday 12th March. Such displays can be obtained by mechanicalor electronic means. Ebauche French term (but commonly used in English-speaking countries) for a movement blank, i.e. an incomplete watch movement which is sold as a set of loose parts, comprising the main plate, the bridges, the train, the winding and setting mechanism and the regulator. The timing system, the escapement and the mainspring, however, are not parts of the "ébauche". Escapement Set of parts (escape wheel, lever, roller) which converts the rotary motion of the train into to-and-fro motion (the balance). Etablissage French term for the method of manufacturing watches and/or movements by assembling their various components. It generally includes the following operations: receipt, inspection and stocking of the "ébauche", the regulating elements and the other parts of the movement and of the make-up; assembling; springing and timing; fitting the dial and hands; casing; final inspection before packing and dispatching. Etablisseur French term for a watch factory which is engaged only in assembling watches, without itself producing the components, which it buys from specialist suppliers. Factory, works In the Swiss watch industry, the term manufacture is used of a factory in which watches are manufactured almost completely, as distinct from an "atelier de terminage", which is concerned only with assembling, timing, fitting the hands and casing. Fly-back Hand In a chronograph with analogue display, an additional centre second hand which can remain superposed on the other one as it moves, can be stopped independently and then made to "fly back" so as to catch up with the other hand, can be stopped and reset to zero together with the other hand. In chronographs with numerical display, a "function" having the same effect. Glass, Crystal Thin plate of glass or transparent synthetic material, for protecting the dials of watches, clocks, etc. Hand ndicator, usually made of a thin, light piece of metal, very variable in form, which moves over a graduated dial or scale. Watches usually have three hands showing the hours, minutes and seconds. Jewel Bearing, endstone or pallet used for reducing friction. Generally made of synthetic material, except for the precious or semi-precious stones (ruby, sapphire, garnet) which are sometimes used in "de luxe" watches. Main Plate Base plate on which all the other parts of a watch movement are mounted (part of the "ébauche"). Mainspring The driving spring of a watch or clock, contained in the barrel. Manufacture d'horlogerie French term for a watch factory which itself produces the components (particularly the "ébauches") needed for the manufacture of its products (watches, alarm and desk clocks, etc). Marine Chronometer Highly accurate mechanical or electronic timekeeper enclosed in a box (hence the term box chronometer), used for determining the longitude on board ship.Marine chronometers with mechanical movements are mounted on gimbals so that they remain in the horizontal position is necessary for their precision. Middle (of watch-case) Middle part of the case, in which the movement is fitted. Movement Assembly consisting of the principal elements and mechanisms of a watch or clock: the winding and setting mechanism, the mainspring, the train, the escapement, the regulating elements. "Anatomically", the movement consists of the "ébauche", the regulating elements and the other components. Regulating Elements Set of parts comprising the regulating system (sprung balance) and the escapement (escape wheel, lever and roller). Repeater Watch that strikes the hours by means of a mechanism operated by a push-piece or bolt. There are various types of repeaters. Quarter-repeater: sounding a low note for the hours and a "ding-dong" for each of the quarters; Five-minute repeater: striking the hours, quarters and five-minute periods after the quarter; Minute-repeater: striking the hours, quarters and minutes; Grande sonnerie (grand strike): striking the hours and quarters automatically and repeating when a push-piece is pressed down; Chiming repeater: in which the quarters are struck on three or four gongs of different pitch. Rotor Half-disc of heavy metal, which is made to rotate inside the case of an automatic watch by the energy produced by the movements of the wearer's arm. Its weight tends always to bring it back to the vertical position. Demultiplied by a specially designed device, its rotations continually wind the mainspring of the watch. Second Basic unit of time (abbr. s or sec), corresponding to one 86,000th part of the mean solar day, i.e. the duration of rotation, about its own axis, of an ideal Earth describing a circle round the Sun in one year, at a constant speed and in the plane of the Equator. After the Second World War, atomic clocks became so accurate that they could demonstrate the infinitesimal irregularities (a few hundreths of a second per year) of the Earth's rotation about its own axis. It was then decided to redefine the reference standard; this was done by the 13th General Conference on Weights and Measures in 1967, in the following terms: "The second is the duration of 9,192,631,770 periods of the radiation corresponding to the transition between the two hyperfine levels of the fundamental state of the atom of caesium 133". Conventionally, the second is subdivised into tenths, hundredths, thousendths (milliseconds), millionths (microseconds), thousand-millionths (nanoseconds) and billionths (picoseconds). Setting (to time) Process of bringing the hands of a watch or clock to the position corresponding to the exact time. Shock Absorber Resilient bearing which, in a watch, is intended to take up the shocks received by the balance staff and thus protects its delicate pivots from damage. Skeleton Skeleton watch: watch in which the case and various parts of the movement are of transparent material, enabling the main parts of the watch to be seen. Stopwatch Timekeeping instrument which can be used for measuring intervals of time. When this is done, the time display is partly or wholly lost until the hands are reset. Striking-work, Striking-Mechanism In a watch or clock, automatic or hand-operated mechanism that strikes the hours, etc, or rings an alarm-bell (v. repeater). Tachometer Instrument for measuring speed. In watchmaking, a timer or chronograph with a graduated dial on which speed can be read off in kilometres per hour or some other unit (see timer). Terminage French term denoting the process of assembling watch parts for the account of a producer. Termineur French term for an independent watchmaker (or workshop) engaged in assembling watches, either wholly or in part, for the account of an "établisseur" or a "manufacture", who supply the necessary loose parts. Timer Instrument used for registering intervals of time (durations, brief times), without any indication of the time of day. Tourbillon Device invented to eliminate errors of rate in the vertical positions. It consists of a mobile carriage or cage carrying all the parts of the escapement, with the balance in the centre. The escape pinion turns about the fixed fourth wheel. The case makes one revolution per minute, thus annulling errors of rate in the vertical positions. Vibration Movement of a pendulum or other oscillating element, limited by two consecutive extreme positions. The balance of a mechanical watch generally makes five or six vibrations per second (i.e. 18,000 or 21,600 per hour), but that of a high-frequency watch may make seven, eight or even ten vibrations per second (i.e. 25,200, 28,800 or 36, 000 per hour). Watch Material Loose parts, components either for producing watches or for repairing them. In the latter case, they are often called "spare parts" or "repair material". Water Resistant Made to prevent water from entering. Water-resistant case, watch-case whose joints are made to prevent moisture from entering. Winding Operation consisting in tightening the mainspring of a watch. This can be done by hand (by means of the crown) or automatically (by means of a rotor, which is caused to swing by the movements of the wearer's arm).